A loose leash dog walk is a joy! Check out this streaming DVD for tips. If your dog pulls on the leash, then the walk is neither healthy for your dog nor relaxing for you. It's also a sign that you and your dog are not paying attention to each other -- it takes two to pull, after all. Walks with your dog should feel like walking meditation, not a battle! Please learn about the BAT leash skills in this article or the BAT Leash Skills webinar before blaming the problem on your dog. It's easier to start out teaching yourself not to pull. Pulling on leash is very rewarding to a dog. What do I mean by this? The action of pulling doesn't feel so bad at the time and it gets them where they need to go. Any behavior as rewarding as pulling on the leash takes a lot of commitment to fix. Keep in mind that a dog that's beside you on a tight leash is still pulling! Think of it this way. Let's say you are a gambling addict, that you like to go out and gamble until you run out of money. As intervention, your family prevents you from gambling. You watch them carefully and about once a week, they aren't paying attention and you slip out for an evening of gambling and you win big. Are you still a gambling addict? Yes. Are you ever going to stop at this rate? No. In fact, I'd say your desire to gamble is probably stronger! So...you have this canine gambling addict in your care, who wants to go forward and sometimes it works to pull, so he might as well try it all the time. What to do? Follow the Training and Management tips below. Note: If you have more than one dog, practice the following leash training techniques on each dog separately, at first. 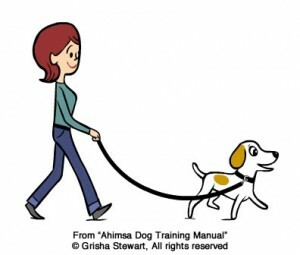 Silky Leash - the core of Silky Leash training is to put very light pressure on the leash and reward the dog when s/he loosens the leash. The step-by-step progression is what makes Silky Leash so powerful. I have more information about that in the Ahimsa Dog Training Manual. Reward him for eye contact. 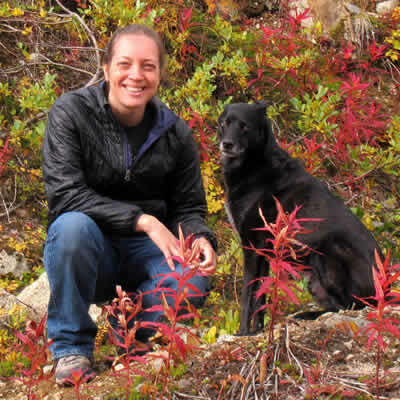 Learn how to use the clicker (see our video on modern dog training). Practice walking on leash or even off leash in the house, where your dog probably doesn't pull. Each time he looks at you, click and give him a treat. Whenever you go on a walk, do the same. This helps bring your dog's focus back to you. It's hard to pull if he's looking at you! Reward him for being in the Sweet Spot. Click and treat whenever he is in the area near your left leg (It doesn't have to be the left, but that's the traditional side. Just pick one and stick with it.) Soon he will begin to think that it is a very good thing to be near you, on your left side. As time goes by, fade out the use of food by treating less and less frequently. You'll need more treats if the distraction level goes up. him a treat. Repeat - over and over and over. If he pulls ahead, back up as well. As time goes on, don't reward him if it was his idea to pull, only if you suddenly walked back without him pulling ahead. This is not a collar correction, just a cue, so don't jerk it to make it hurt - the goal is to make it gentler and gentler, until a slight tug from you puts your dog back in place. As time goes on, you will stop walking backwards, just reward your dog at your side and keep moving forward. This is similar to Silky Leash, but you can do it on your regular walk. Feeding Tree. Dogs have a natural resistance to pressure, called the Opposition Reflex. This helps them get out of brambles that catch at their fur, but makes it hard for us to teach them to go into the direction of a pulling leash, not away from it. 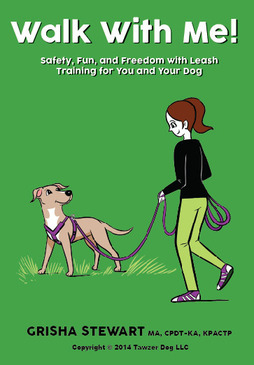 Leash pressure can be from a dog stopping or from a dog pulling ahead, or from you changing directions. Do not allow the dog to go where it wants to on a tight leash. You can just stop, be a tree, and wait (or back up or keep walking forward, letting line out as you go). When the leash pressure eventually eases up - you should feel this in your hand, though you can see it by the way the leash begins to sag - click and give the dog a treat at your side. You can do this inside the house, and I think that's the best place to start. It's best to combine the Feeding Tree with rewarding for the Sweet Spot, else the dog is forced to pull on the leash to get more cookies. Speed as a Treat. I think I made this one up; somebody correct me if I'm wrong. A popular technique is to "be a tree" if the dog gets to the end of the leash. You can extend that technique into what I call Speed Training by walking fastest when the dog is next to you in heel position (speed = 1) and slower as s/he gets farther away (speed =.75, .25, etc.). 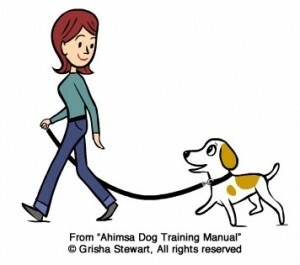 Slightly before they arrive at the end of the leash, you have the option of slapping your thigh or saying something like "easy" and if s/he reaches the end, either stop (speed = 0) or do the Cha-Cha (speed = -1). At first, the maximum speed might be running - whatever pace your dog wants. As the weeks go by, it's gradually slower and slower to match our boring human pace. By inserting the word "Run!" or "Quickly!" 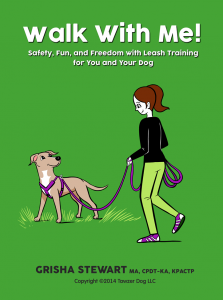 just before you speed up, you can also teach your dog to walk fast on cue - great for intersections. Focused Walking. This is a technique that I learned in agility class at Dog Sports Northwest near Seattle. Teach your dog to follow your finger, as a fun game. This is your defense against cats, children, dogs, and other fascinating things. Let's say your dog is on your left, leash in your right hand. Put the clicker in your right hand as well and load your left hand with treats. Put one finger out on the treat hand, like you were pointing at something. Encourage your dog to chase that finger (remember, this is a fun game, not a boring obedience exercise! )Click and treat right as they get close to the hand target. After about ten times in a quiet setting, your dog will probably follow the target with no food in the target hand. Click and feed your dog dog a treat from somewhere else, like your right hand. You'll need to work on being able to stand up straight while your dog does this. If she jumps, just click when she's on the floor, and she'll stay on the floor more. Remember, dogs do what works! Work on your relationship. Pulling on the leash can be a sign that your relationship with your dog could use a little tweaking. Do you demand that he pay attention to you without you paying attention to him? One way to improve your relationship is to consistently ask your dog to Say Please to get what he wants. (see our handout on the Say Please Protocol.) On a walk, for example, you can ask him to sit and look at you before he is allowed to take a long time sniffing something. Set your dog up for success. For all of the above techniques, work in situations where your dog will be successful. If you take him out to train and he is just a basket-case, pulling every which way, he is not going to learn, and you will just become frustrated. Believe me, I've been there!! Back up a step or two -- work at home, inside, with only a few distractions. Then work in the yard. Next, work in front of the house. Make your training walks longer and longer. Avoid distractions that your dog is not ready for: if you can make it to the park, but not through it, for example, bring along one of the management tools below for the currently-impossible stage of walking nicely through the park. Long Line. You need to learn how to use it first, but a longer leash means your dog will pull less. I recommend a 15-foot leash in most cases. Your dog can walk ahead of you, as long as the leash is loose. Body Harnesses. There are many kinds of body harnesses. Front-attachment harnesses offer great control but are best used with two points of attachment (clip on back of harness with one end of your leash and the front of harness with the other end). For brands, I like the Balance Harness, XtraDog, and the fleece-lined PerfectFit from the UK. Learn how to use the BAT leash skills so that you can use a regular harness instead of a no-pull harness. If you need extra control, you can use two points of attachment on the harness or combine the front attachment harness and a head collar using a double-ended leash, and then fade out the use of the head collar. Never use collars or other devices that are intended to startle or cause pain. Be careful when you are picking out a “no-pull” harness. Try to figure out why the dog wouldn’t pull. If it’s because it hurts to pull, you might want to keep looking. I like the harnesses that have multiple points of attachment best. Benefits of clipping one snap to the front: The dog turns around to face you when it tries to pull. These harnesses are especially made for hooking up in the front and do a great job of redirecting the dog. Adding in a front clip is one of my favorite management options, because dogs take little or no time to get used to a change in leash configuration and it works very well. Drawbacks: you need to be sure that your dog's harness is fit well and allows for full range of motion on the dog's legs and shoulders. Clipping to the front only may cause alignment issues. Do not use an EasyWalk harness because that often slips down. Even fit "well," it usually restricts the dog's range of motion. Build-it-yourself harness. This is an emergency method. Let’s say you are on a normal stroll, you thought you’d be in a training mood but suddenly, your teen-aged Fido is just too irritating to deal with. To make matters worse, you left the harness at home. Take your leash and loop the handle end under the dog’s midriff. Now you have two places to grab the leash — one on either side of the dog. Gather both of them up in one hand and you’ll have more control than you had before. There are lots of ways to make your leash into a harness – experiment! Don't drag your dog, either! Options I generally don’t recommend. I prefer not to use head collars whenever possible. I don’t recommend the use of slip chains (a.k.a. choke chains), prong collars, basically any collar that works because of the pain or irritation the dog will experience. They lead to aggression too often for my liking, and they get in the way of training. I always recommend the use of less forceful options, but have very, very, very rarely (as in a few out of several thousand) consented to allow a client the use of a prong collar for dogs that were already using them and simply could not tolerate head collars and are too strong for front attachment harnesses. Even then, I feel like we should’ve done something differently, like referring to a TTouch practioner, who could’ve helped their dog get more comfortable with the head collar. In those cases, the leash was attached at one end to a harness and the other end to the prong collar, so was only there as a back-up. You could also use two leashes or a double-ended leash like the Symmetry Line. If you feel you must use a prong collar, I recommend something like the protocol used by Suzanne Clothier, where you basically tap the brakes and don’t let the dog hit the collar at full speed. Then try to transition back to a more humane method asap, by training the dog as much as possible in low-distraction environments.